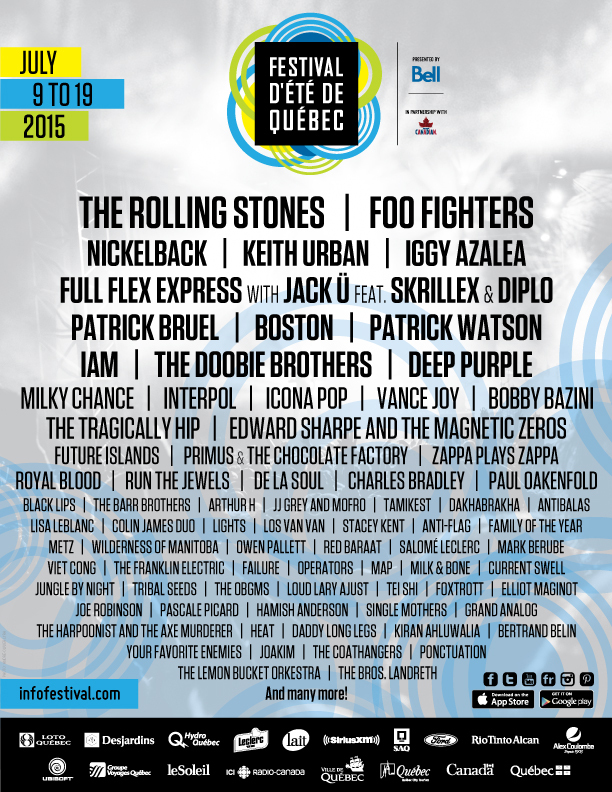 Festival d’été de Québec, running over 11 days between July 9th and 19th throughout venues in downtown Québec City, boasts the largest outdoor main stage in North America. Fitting, then, that they’ve put together an equally massive bill for 2015. The Rolling Stones and Foo Fighters headline the event. Sorry, you need more than that? Well, there’s also Interpol, Future Islands, Run the Jewels, Primus, De La Soul, METZ, Viet Cong, Owen Pallett, Royal Blood, Failure, along with Keith Urban, Iggy Azalea, Full Flex Express with Jack Ü featuring Skrillex and Diplo, Patrick Bruel, Boston, Patrick Watson, The Doobie Brothers, Deep Purple, IAM, Milky Chance, The Tragically Hip, Edward Sharpe and the Magnetic Zeros, Paul Oakenfold, Charles Bradley, Icona Pop, Vance Joy, Bobby Bazini, Royal Blood, and Zappa Plays Zappa. Yeah, it’s that kind of lineup. There’s only one thing missing from all this awesome: you. That’s why we’re giving away one pair of GA passes for the entire event. To enter, simply fill out the information requested in the widget below. You can earn bonus entries by sharing through social media, downloading the Consequence of Sound app, and other simple tasks just by clicking a button. Entry automatically enrolls you in the Consequence of Sound newsletter. Winners must provide their own transportation and accommodations.